Want to introduce ourselves to the members of the AAB community! 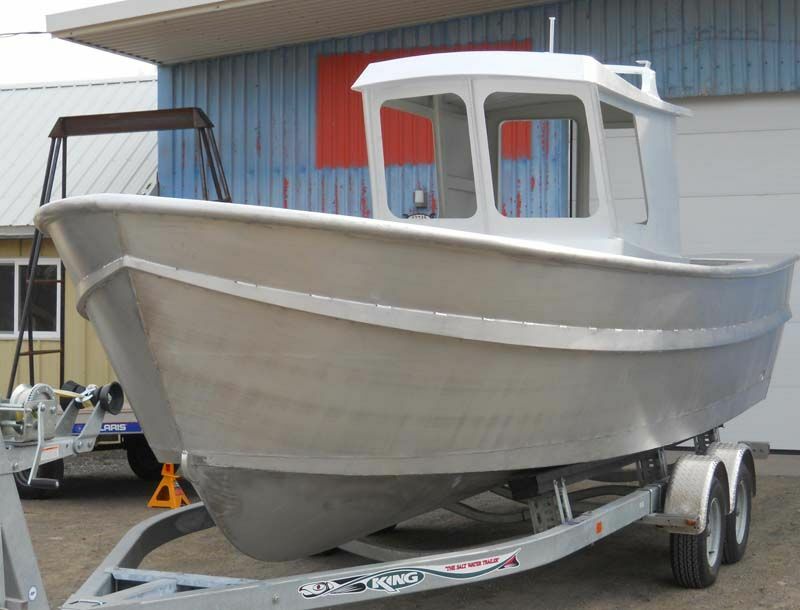 Winninghoff Boats has been in business for over 40 years but has recently gone under some changes. Earlier this year, the founder of Winninghoff Boats, Jack Winninghoff, sadly passed away at the age of 92. 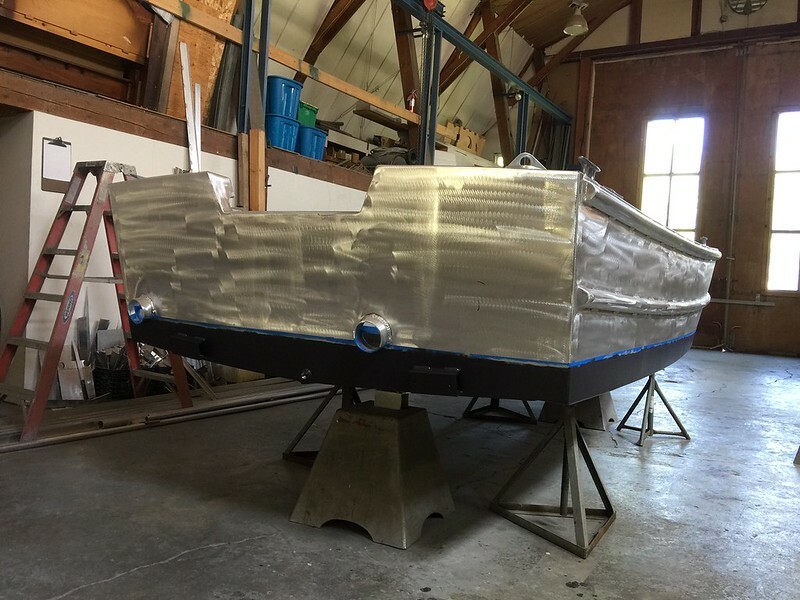 Jack was a pioneer in the aluminum boat industry and poured his heart and soul into what he did. Jack left the company to myself, Bill Stone, because I had the pleasure of working with Jack for over 25 years. 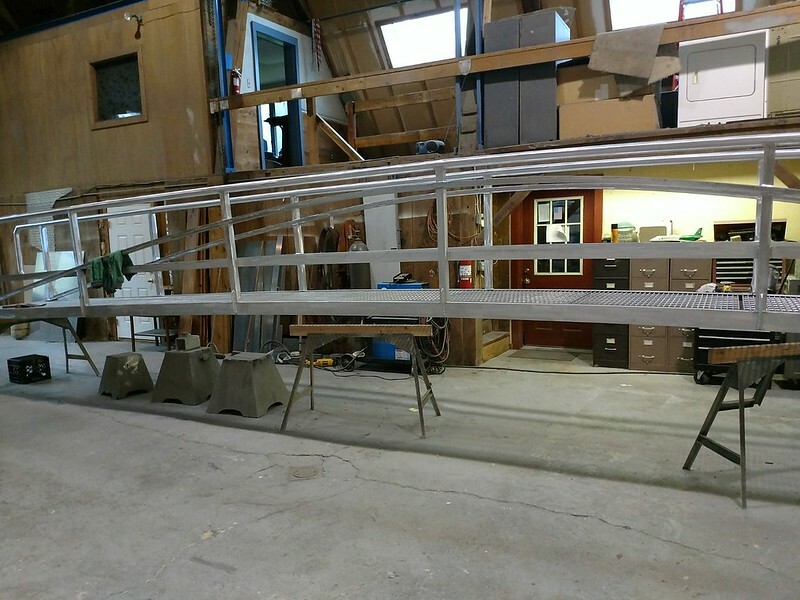 Not only did I consider Jack a dear friend but also learned a lot from him and will continue to use my knowledge and passion to continue building aluminum boats under the Winninghoff name. 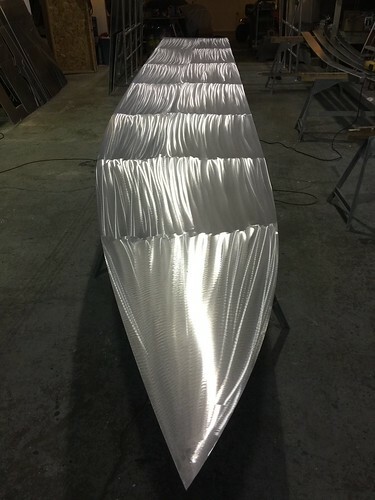 For those who are not familiar with Winninghoff, and the work we do, we are an aluminum boat building company. 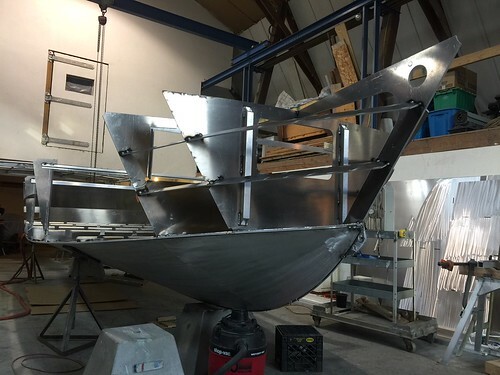 We approach every boat build differently and cater specifically to our customers exact needs. From custom length, width and deck layouts, we're here to help make the customers ideas come to reality. 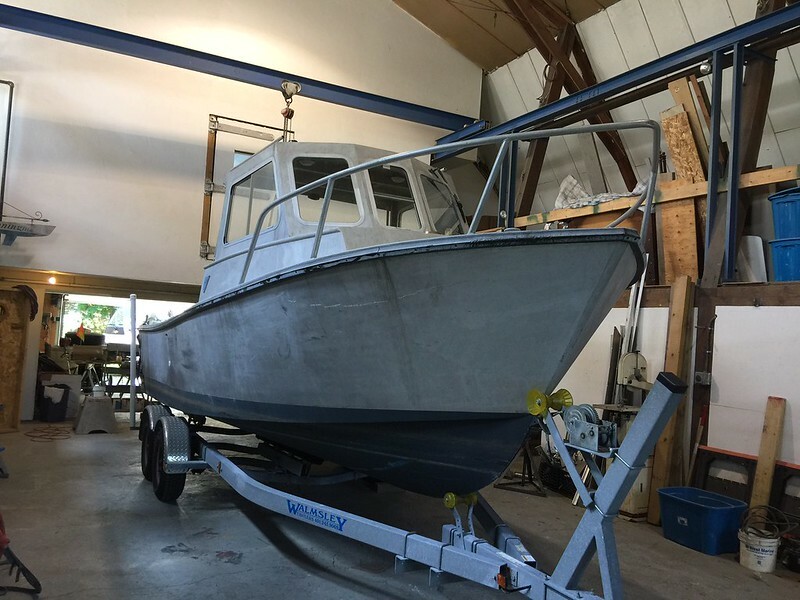 Beside boat building, we can help with boat modifications, ladders, water tanks, fuel tanks, truck racks, trailer modifications and gangways. 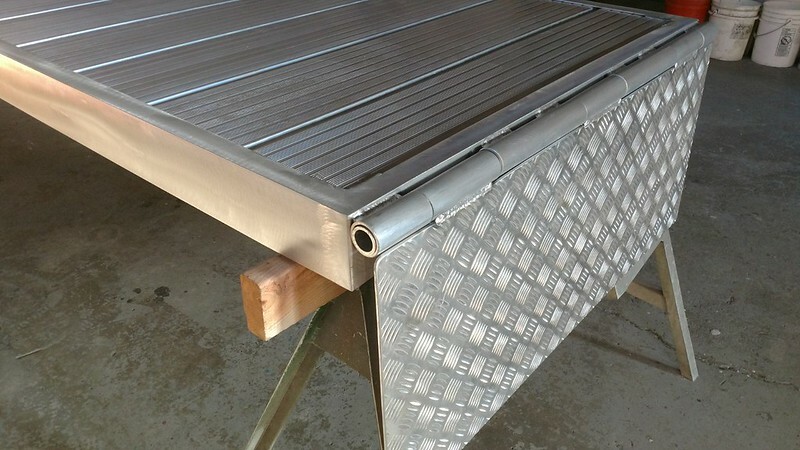 If you have an idea the needs to be built with aluminum, we can help. I will post some pictures of our past projects and will post updated pictures of current projects we have going on. Feel free to contact us with any questions. 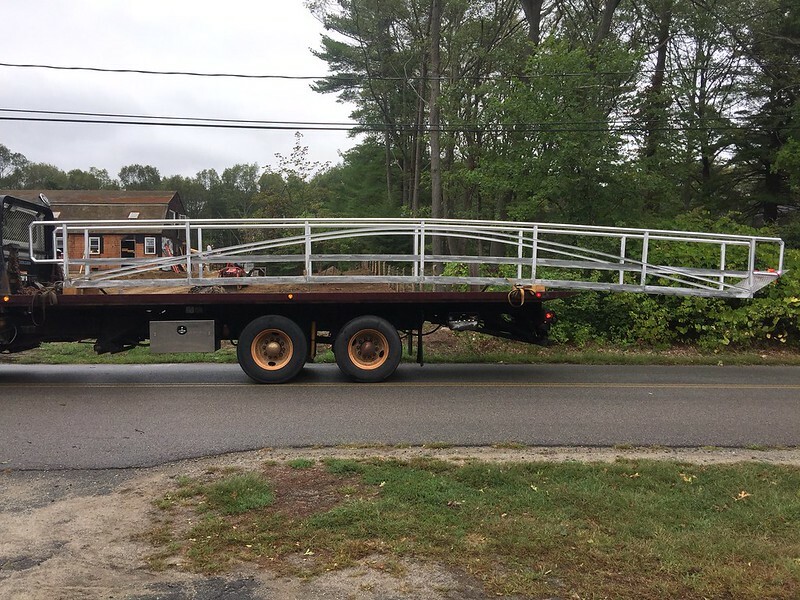 Our latest project was a 36ft gangway for a marina in Gloucester, MA. 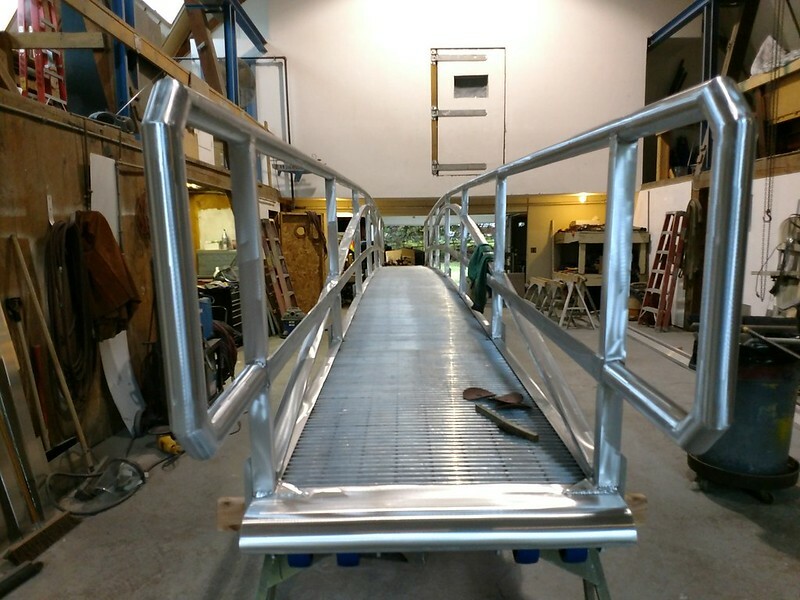 The hinge system you see in the picture is not of this actual ramp but what we use on all our gangway systems. This project came in with some hull issues and a leaking gas tank. 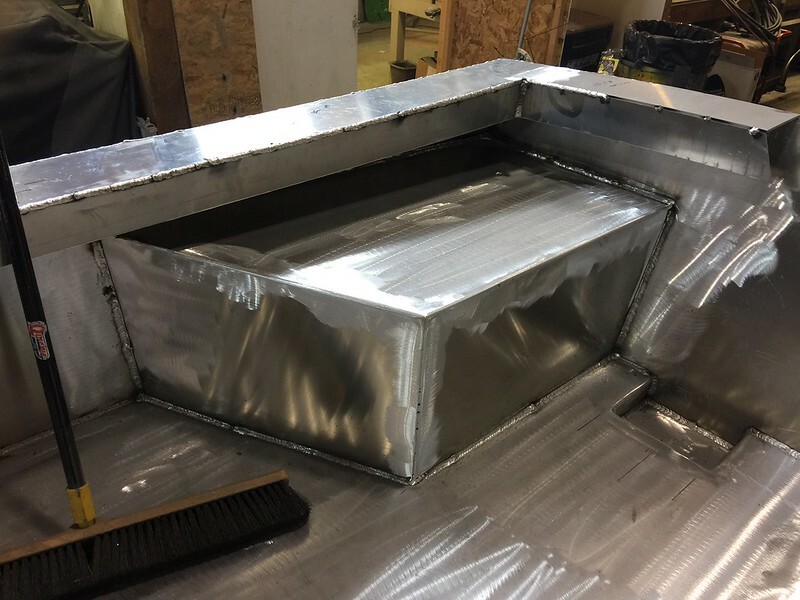 We cut in a new access panel in the deck, removed the old gas tank, sandblasted and repaired the hull, painted the inside of the hull, made a gas tank bed and new gas tank with all new fittings and hoses. 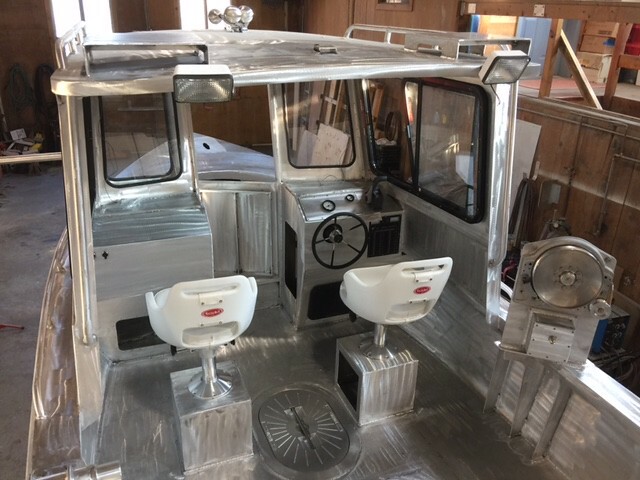 This boat build was for a local fisherman who has a pretty interesting job. He catches horseshoe crab for scientific research. Once they're caught, he brings them to a lab where blood is drawn from them, but just enough blood to stay alive. Once the lab is done with the crab, he returns them to the ocean so they can be caught once again. 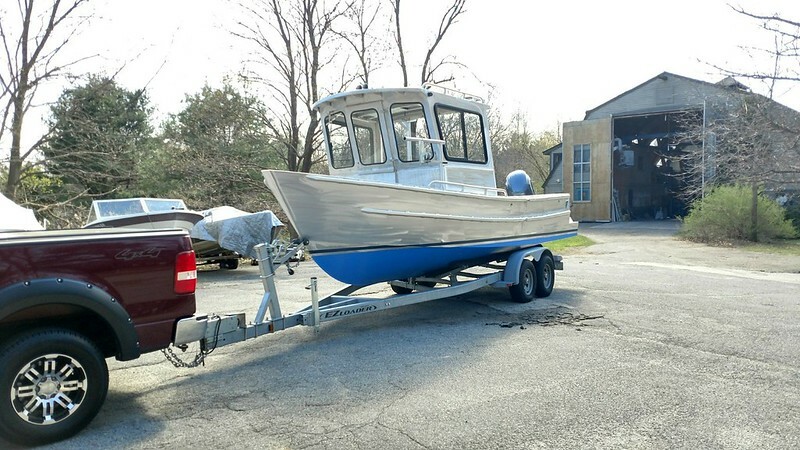 This is an 18ft boat with an open layout and rear seat box. You'll also see 2 large holes in the transom and that's so he can easily clean the deck of the boat and let water and debris run out the back. Last edited by Winninghoff Boats on Thu Sep 28, 2017 1:30 pm, edited 2 times in total. 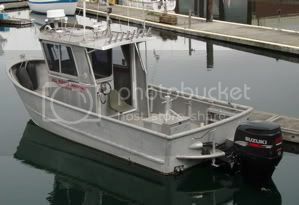 Here is our 24ft research vessel we did for Cornell University. 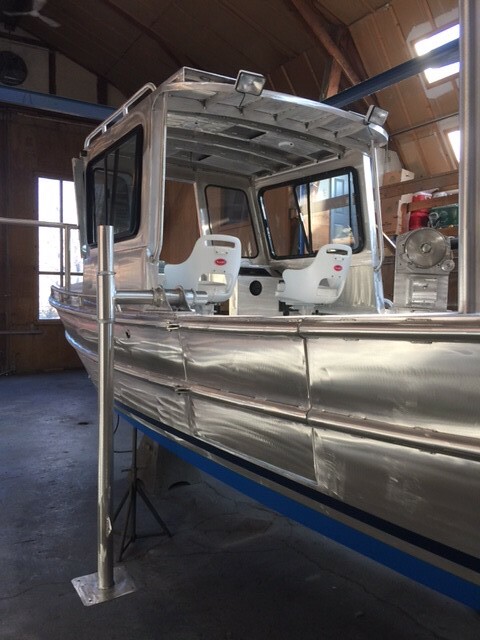 There was a bunch of custom touches we did with this boat including multiple davits, pot hauler with mount, gallow system for nets and side sonar mounting. 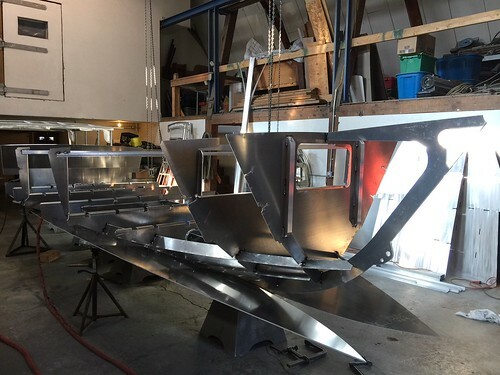 Bill is one helluva boat builder. Both he and Jack repaired my Pacific, and added the spray chine as well as a few other enhancements a few years back. 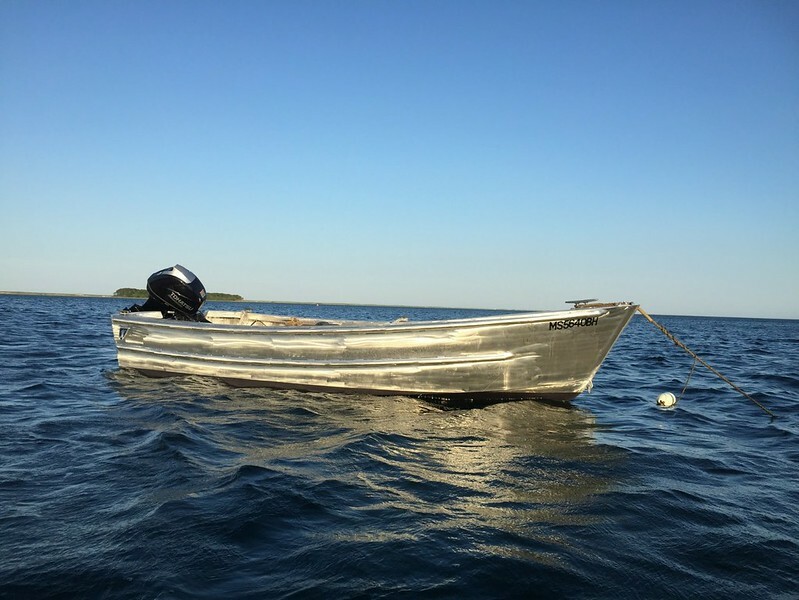 Bill, the skiffs looked nice, Winninghoff is one heck of name to uphold, so: here's some links to consider - finish is important even in a work boat. 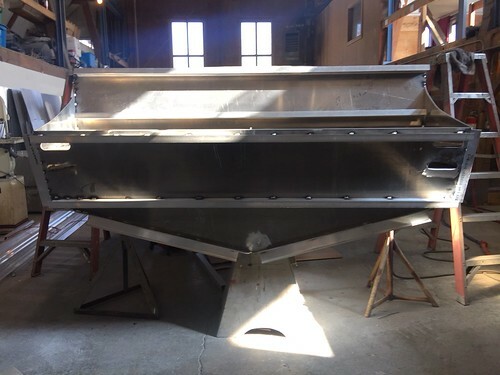 Getting scale off is important, even if too few builders agree and even name production builders' skiffs show up with early "corrosion flowers" in just one or two seasons because they refuse to accept that mill scale is toxic to boats! All the sheet material has been buffed clean of mill scale- you can see some drum chatter in the lower topsides' near the deck line. 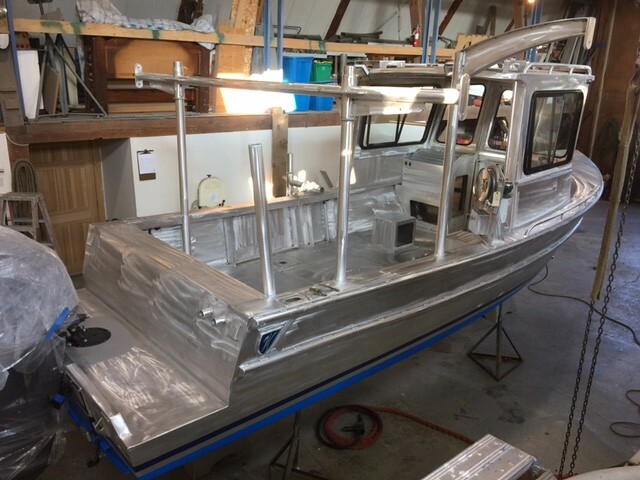 THe skiff was still acid etched and the cabin is white metal etched in the photo- but all parts were buffed before it was assembled. Yep it take a bit of time but the images of your skiffs above show lot of hand work- the drum sander runs the entire part through in a few minutes (power feed) and back and forth if needed- I used the brown (coarse) grit to get the mill scale off, also makes a good anchor pattern if your skiffs will be painted? an alternative I've found that is worth the money (200$US) is the Eastwood roller contour sander/drum buffer. http://www.eastwood.com/eastwood-contour-sct.html this roller drive contour sander has Scotchbrite-like drums that will give a good finish compared to the 4" or 7" rotary you're showing in your posts? You wouldn't leave welds looking like that buff job! 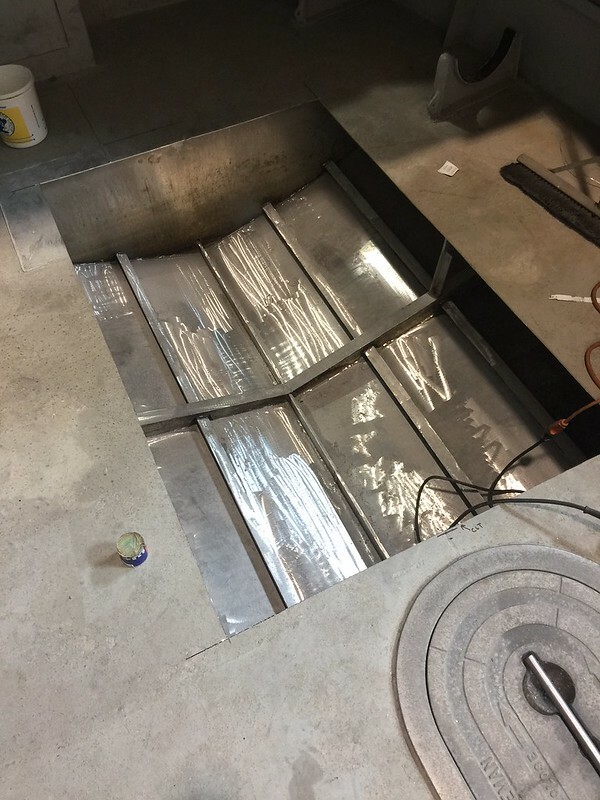 So why leave the surfaces of your fine skiffs looking like the surface cleaning wasn't as important as other steps in your build? 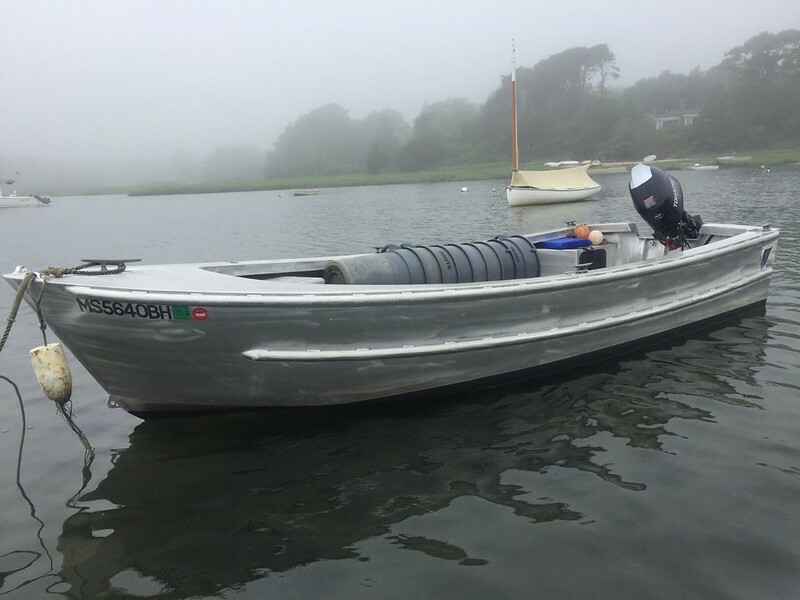 I've built my share of skiffs and by using vinyl rollers mounted to saw horses; I cleaned the 25' long topsides- both sides, of the skiff shown above in an hour's effort with two men. That surely does rival the time to hoist a hand buffer and clean the sheets- but the drum sander's results are cleanly parallel lines which make the tool repay the labor saved as combination of uniformity and more pro-looking surface. Just another old builder ranting about mill scale and since I'm so glad "you take it off"- wanted to suggest you consider the methods I've used and found most helpful. Say Bill, we could use some build threads around here- and obviously you guys are building and repairing? Please take a few minutes now and then to post up some of your current work? I'd sure enjoy a few more pictorial threads, and I'm sure others would too? Thanks for the warm Welcome AAB! Kevin, thank you for the advice. 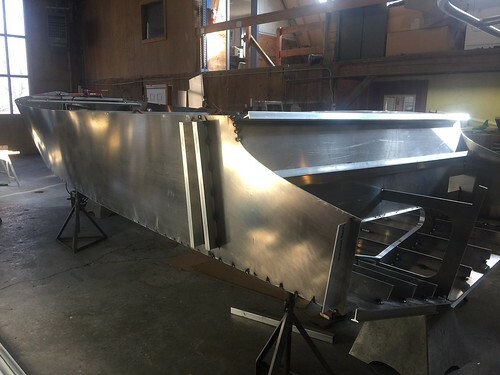 We're always looking to upgrade or improve the way we build boats so I'll look into the methods and tools you recommended. 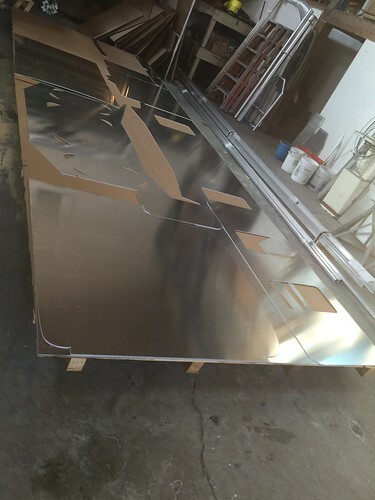 Aluminum just arrived and we've started the unpacking and sorting phase of the project. I also got to grinding some of the hull to prep it for paint when the time comes. More updates and pictures to come! 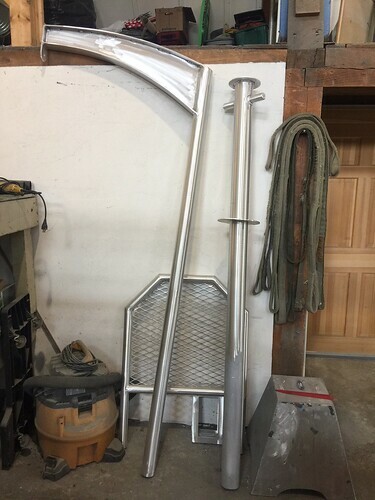 If I were building full time, again, I'd take time to work on a rotisserie fixture too! 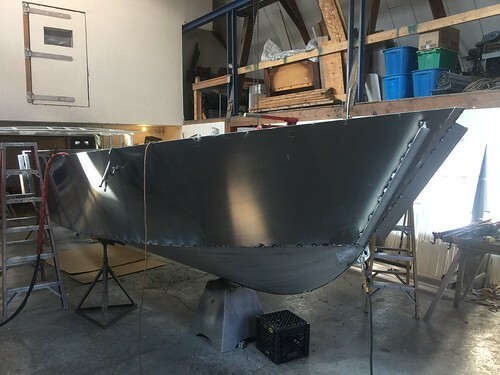 I built a couple hundred skiffs keel down & flipped 180 and I don't think I'll ever do it again after building the simple rotisserie (Davis Jig) to roll the skiff's for access to weld, fit and clean. I have a few of them now, some heavier than others and longer too. 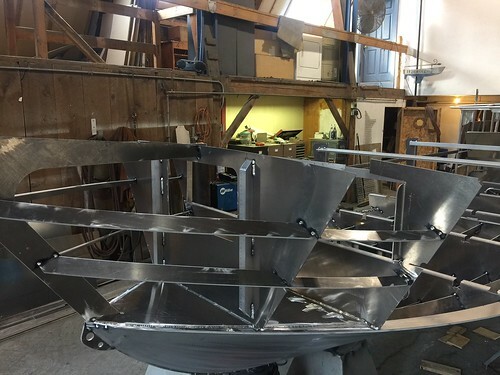 I've done the "time" or level of manhours effort and there's no comparison - the time to design and build a rotisserie returns in a few skiffs and becomes pure profit- or lowered bids and therefore more work- from the 2nd or 3rd skiff on. Worth considering for the <32' boats. 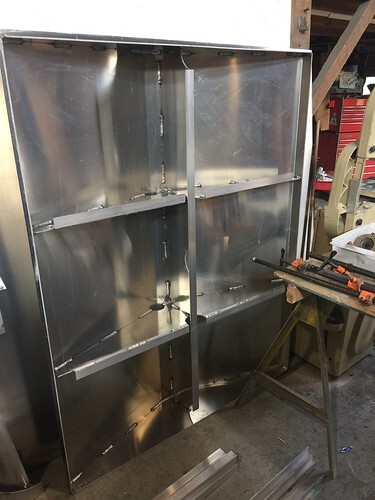 At that size the rotisserie is an considerable investment and your LOA average project has to be considered before building rotisserie fixtures. I hope the buffing on the bottom panel to get the mill scale off is on BOTH sides? Using the Eastwood and a coarse roller (and a min. wage shop helper with his breather on!!) you could scale this sheet using long 1x4's to guide or better yet - feed the sheet into the drum sander and be done! looking forward to the build progress images when time allows. 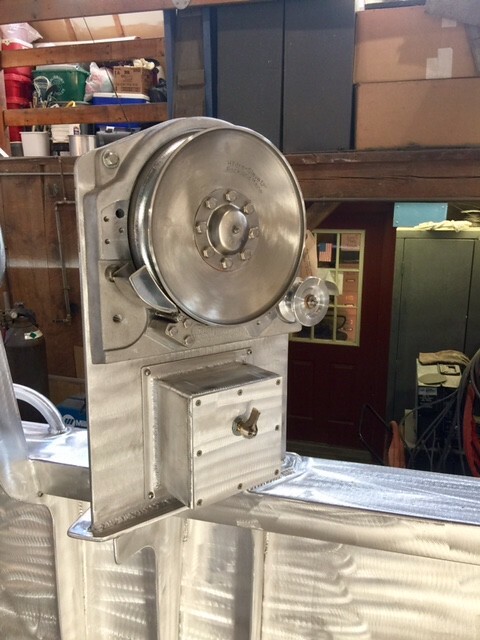 I'd also suggest you consider looking into the OTC (Dahien) TIG GUN, a water cooled 300 A, cold wire feed, TIG gun that allows very high rates of TIG- competes with MIG in many hull locations due to the quality and wire fed speeds. I have an article here somewhere, on mine, and the work that's possible using this TIG wire feed gun to produce better-than-MIG seams in Mig-like time. 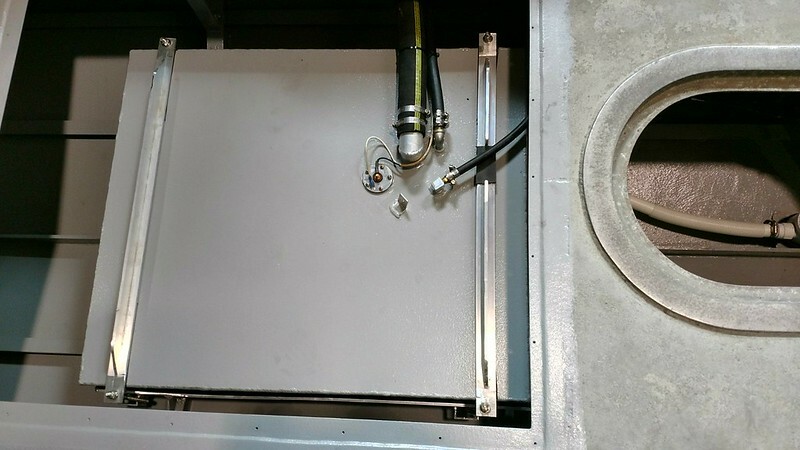 Worth your investigation- but does require training and a dedicated welder to operate. 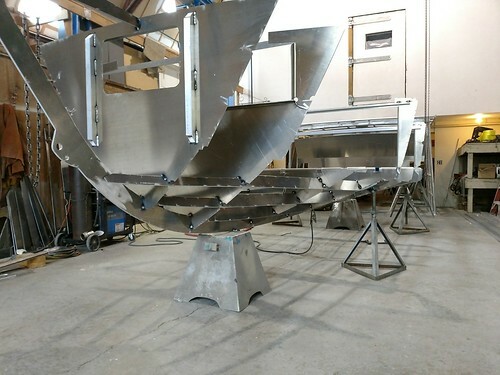 from the AAB.com Forum, mill scale "gnat-zee". 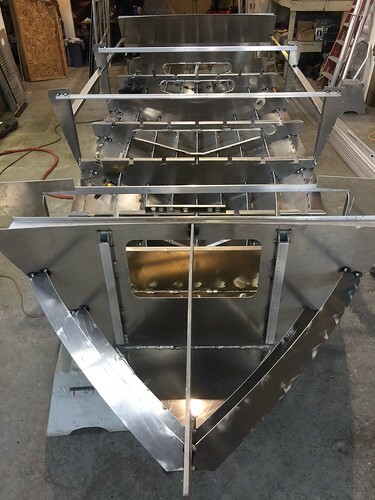 Just a little update on our current 25ft build for a local marina. 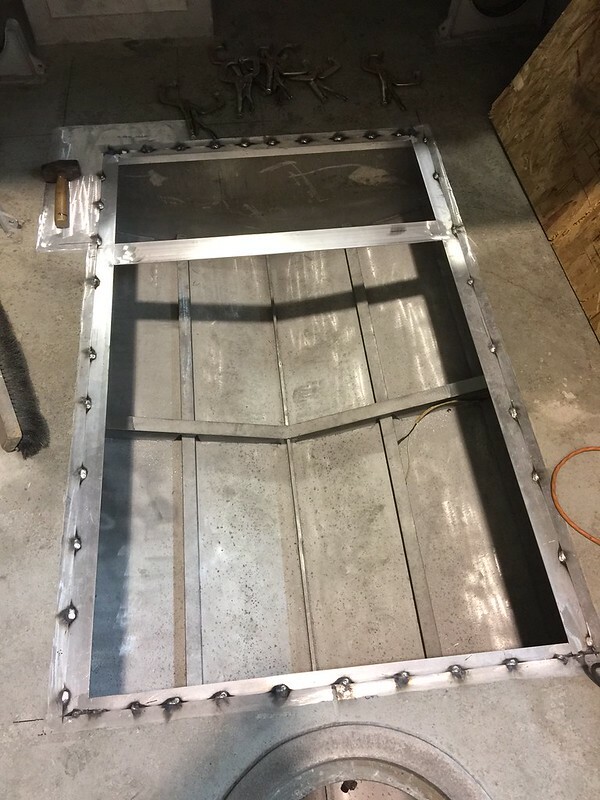 Welding the bottom plates into place now! 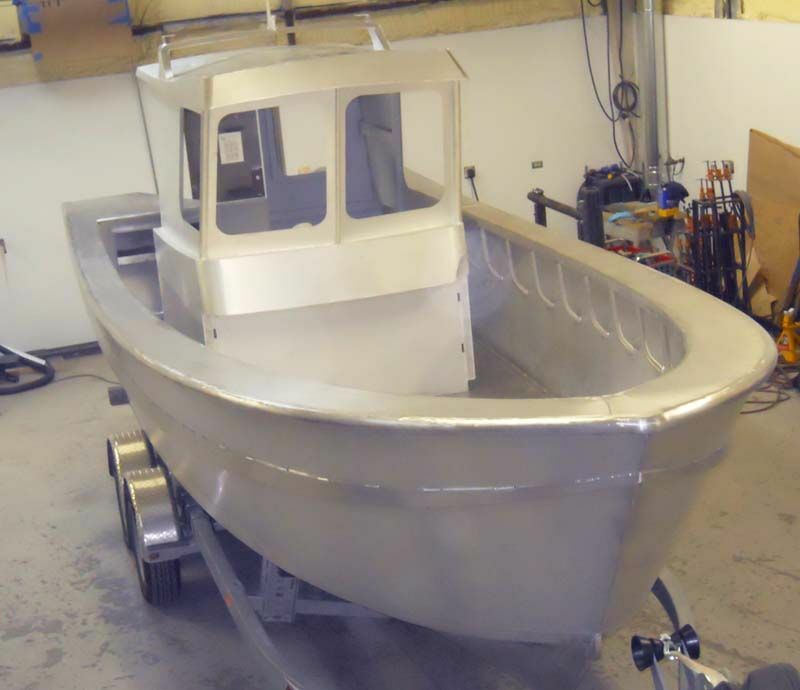 Feel free to reach out to us about a boat build you may be interested in! Really looking forward to watching this build come through. More pictures! 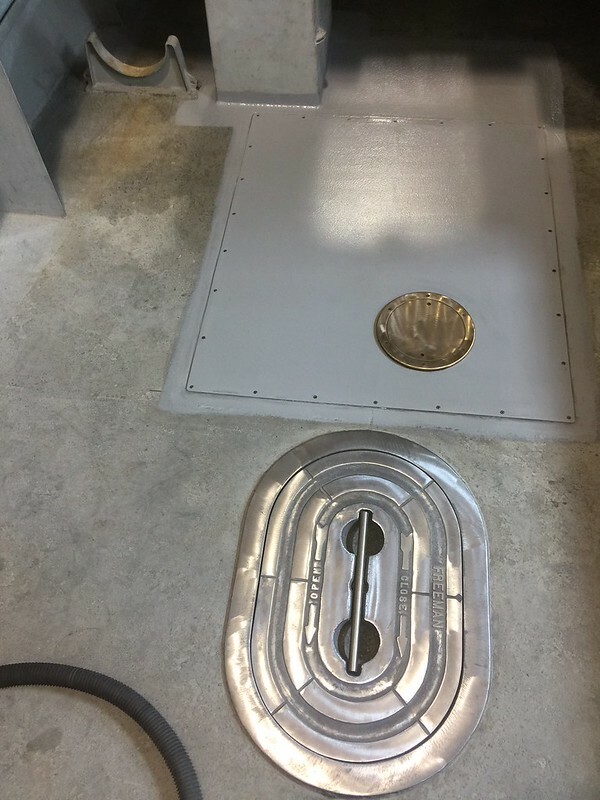 Bottom plates are in place! 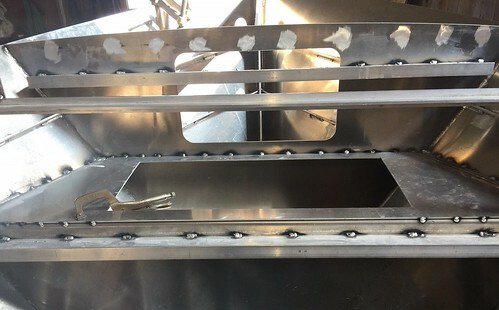 We also have the aft storage trays tacked and waiting on the forward trays to be bent! Once that is set the side plates, side decks and combing are next and look to have that complete by the end of the week. After that will be fuel tank construction and laying the tank into the hull! Moving right along! Some more updates for you guys! Been crazy at the shop with fuel tanks so we've taken a bit of time off from the boat build to get the tanks completed. 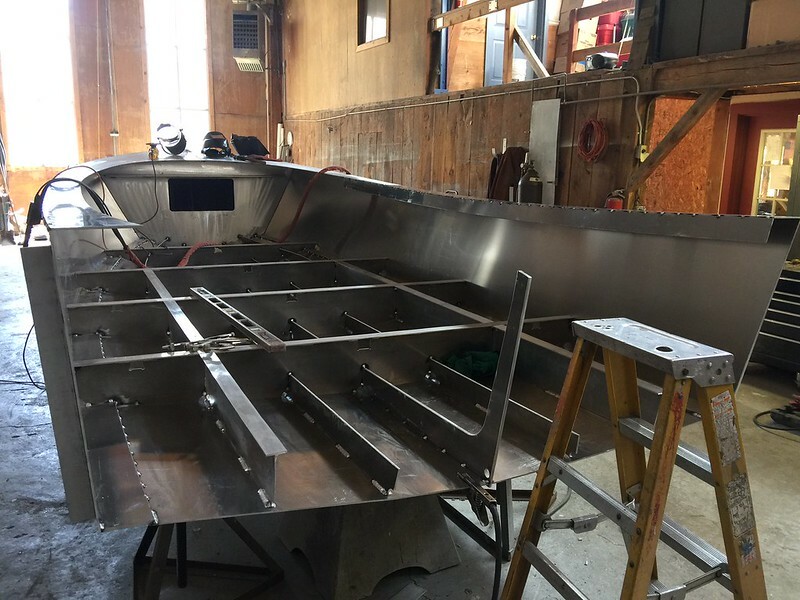 We've got the side plates, transom, margin plates, seat/storage locker and scupper boxes welded into place. 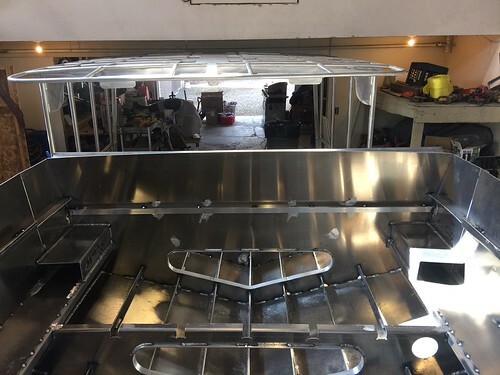 We have the tank almost built and are just waiting on fittings and mapping out where the fittings will go. 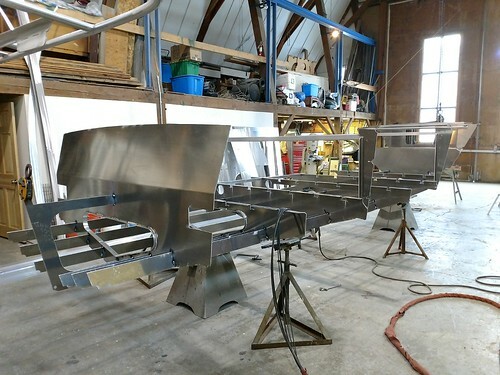 Once that is complete we'll weld the top on and pressure test it. The davit, tow post and tow post guard have all been built as well. A little slow going on the 25 footer as we've had other projects going on! 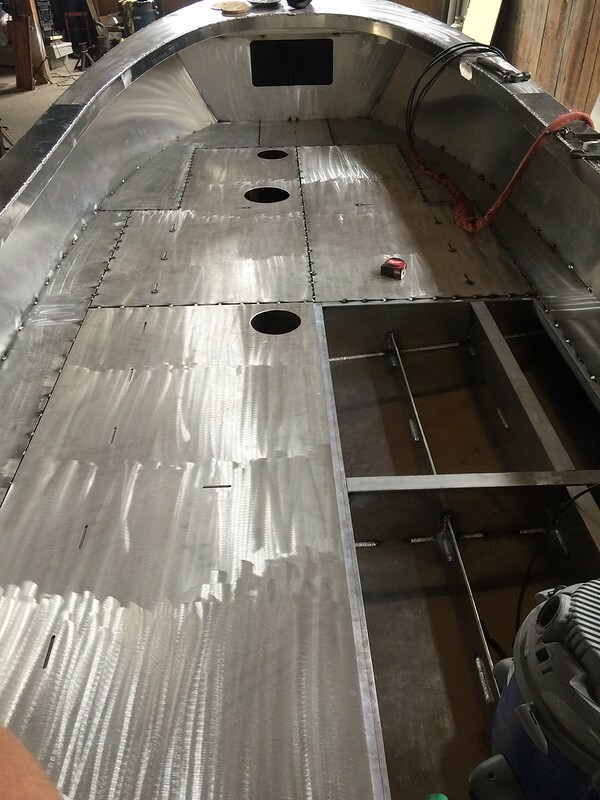 Some of the deck has been laid down, fuel tank bed has been welded into place and the fuel tank is being mocked in the boat, transom has been completed and the push knees are staring to come together! Pictures to come once I get a chance! We also had the opportunity to be on a TV show called "Smart Boating" ( https://smartboatingus.com/ ). 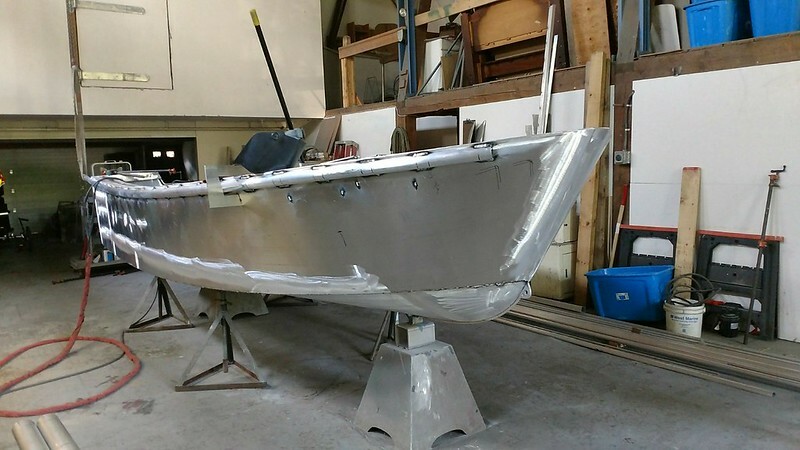 Paul Jermain came in with his crew and we got to talk about aluminum boat building and how the process works! We had a great time and can't thank Paul enough for highlighting the shop! Check out the video below!